Retractable Car. During Discovery Time at the beginning of class, we worked on a basic car. They used corrugated plastic bodies, taped on straw wheel bearings, threaded wooden dowels through those and attached wooden wheels. During opening circle, we tested these. Then I explained to them that we would take them to the next level by adding a retractable badge clip to motorize it so it could run on its own as a pull-back and release car. I demo-ed a sample. We worked on and tested those during Tinkering Time. Then, during closing circle, I explained how the bigger a wheel’s diameter, the further it rolls on each revolution. I challenged them for “homework” to try adding big wheels to their car to see what happens. I demo’ed my car with CD’s added for wheels. See a tutorial on how to build these cars here: https://inventorsoftomorrow.com/2016/10/26/build-a-moving-car/. I was pretty happy with how the project turned out, but I do have to say, there’s a lot of prep worked involved, plus the materials are a little pricey. $1.60 per car for wooden dowels and wheels, plus around $1 for a retractable badge. To read a full post about this project, and see lots more pictures, go to https://inventorsoftomorrow.com/2016/11/01/design-a-car-2/. Process art – Monster Truck Painting: We put paper on a table, then poured three blobs of paint on the table, and added three “monster trucks” from McDonald’s Happy Meal toys that had big treads on the tires. These are the kind of car that you pull back on and they roll forward on their own. We put toilet paper roll bumpers all around the table so they wouldn’t be constantly flying off the table. (None ever actually left the table with this set-up) This was a big hit with our 2 to 4-year-old boys. You could also offer: Cut out shapes from paper that children can use to assemble a car collage out of geometric shapes; coloring pages with pictures of cars, or large paper on the floor that kids can draw their own cities and roads on to drive cars around. 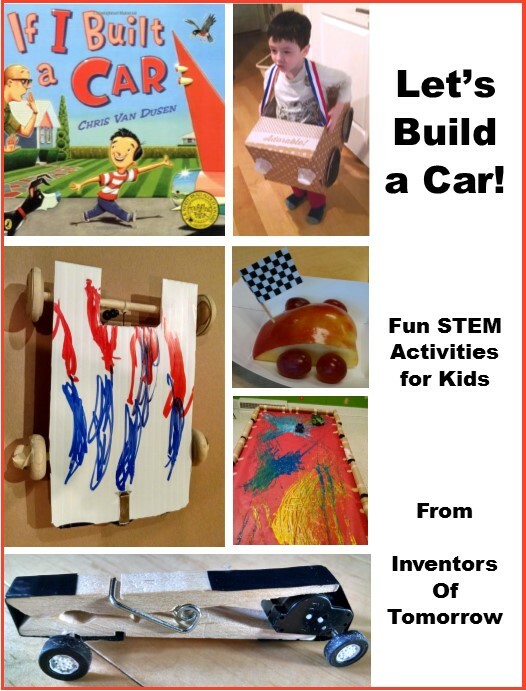 Race a car: We set out blocks, black foam core boards or plastic panels, ramps from Kodo Engineering, toy cars, and a yard stick. 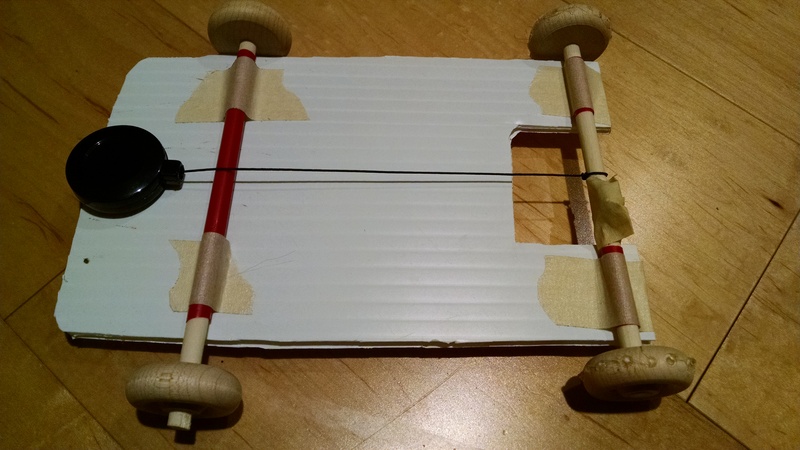 Kids could build ramps, race cars down them, and measure how far their cars went. They could notice whether the distance travelled was affected by how steep the ramp was. We’ll also put out these cars from a Delta Science Modules kit we inherited. 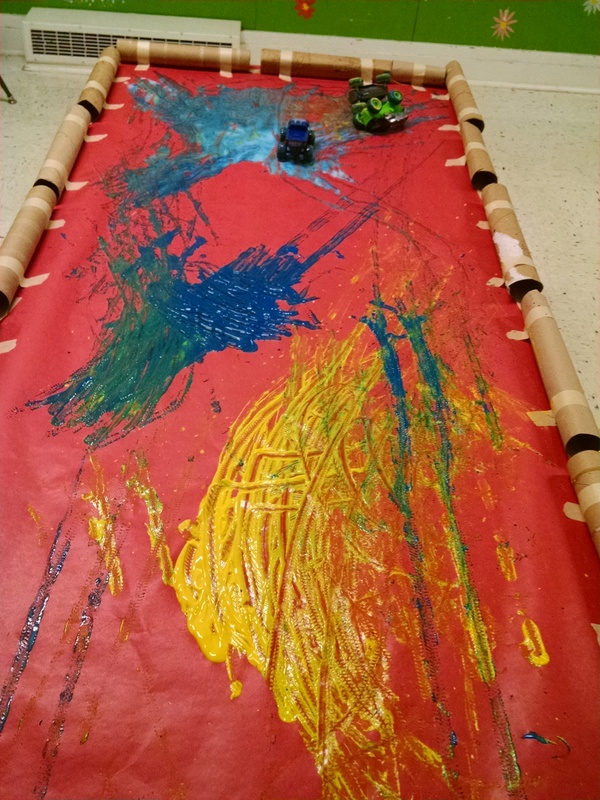 Free play: We filled the sensory table with kinetic sand and toy cars to drive around in it. We had a steering wheel and set of brake/gas pedals that had come with a video game driving simulator, and we set those up on a table for pretend driving play. (Also on the table we put laminated photos of “view out the windshield” with views of ocean, woods, snowy roads, the moon, and more to enhance their imaginary play.) 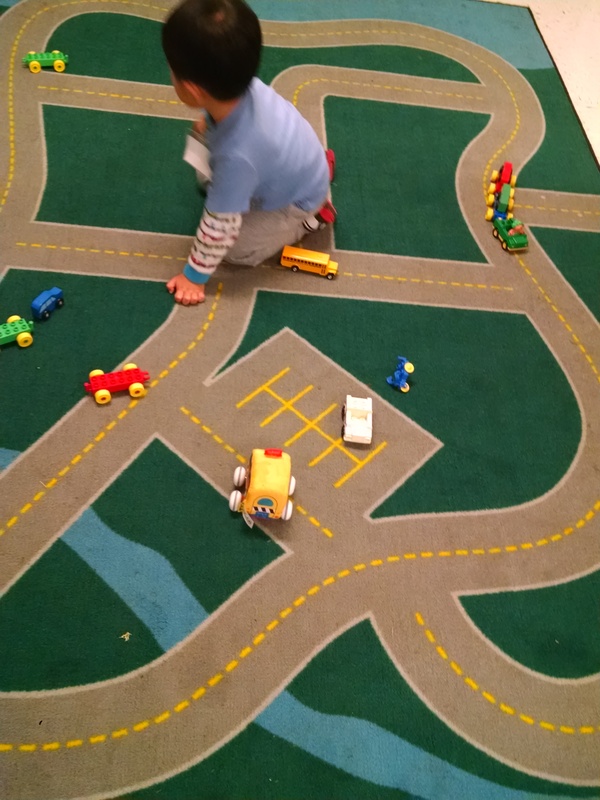 We have a large rug with a road drawn on it, so we put out more cars for them to drive around. We also put out one of these two Duplo car projects: the Duplo car launcher, and the Measuring Car. Some children would take apart the Duplo project and re-build it. Some just play with the assembled kit. Snack: Our snack volunteer brought in a great creative snack! 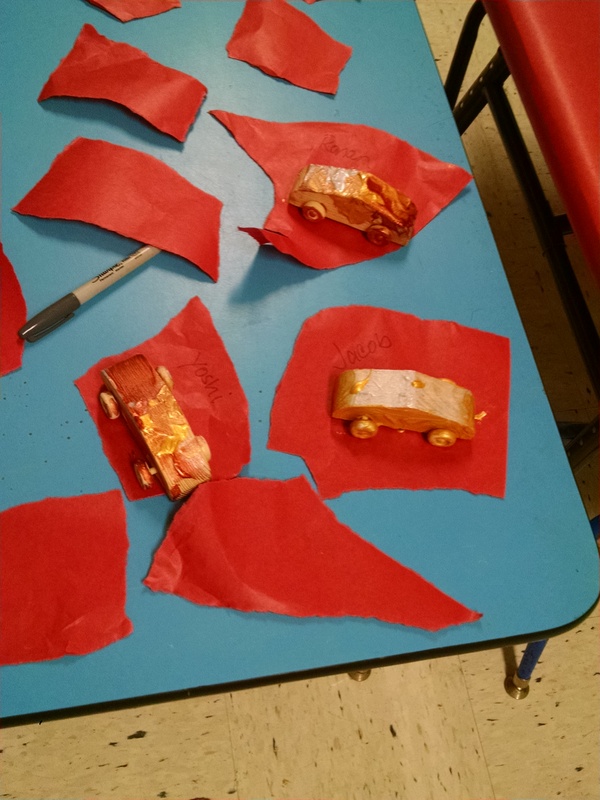 Apple slice cars with grapes for wheels – check out the photo at the top of this post. Books: I didn’t find any books that were specifically about the relationship between cars and simple machines, but there are lots of great car books. 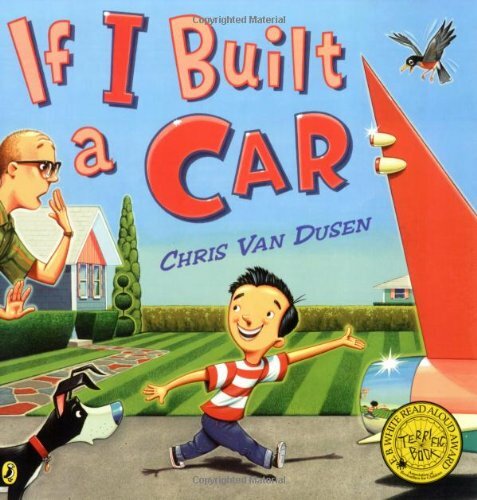 In our opening circle, we read “If I Built a Car ” by van Dusen. This is a very fun read-aloud fantasy about a child designing and building a fabulous car: “I’ll show you inside. I’ve put in a couch. It’s comfy and wide. Plus a fireplace, fish tank, and here’s something cool – The floor can slide open, and look – there’s a pool!” Wonderfully retro styling on the car, with chrome and fins. Other nice book options: “Pete the Cat: The Wheels on the Bus“, because who can resist such a great combination? I would highly recommend Going Places, described in my Books about Inventors recommendations. A good option for toddlers is My Car by Byron Barton and for preschoolers, check out Cool Cars by Mitton and Parker and Cars Galore by Stein, Four to five year olds like Richard Scarry’s Cars and Trucks and Things That Go . For awareness of other cultures, read Galimoto by Williams and Stock, which tells the story of a young boy in Malawi Africa, who wants to build a galimoto – a word that means car, but it’s also the name of push-toys made by children. The boy has a box with all of his worldly possessions – a ball of plastic bags tied with strings, a knife made from a tin can, and a puppet made from cornstalks. He has a few pieces of wire. Throughout the story, he scavenges, scrounges, and trades for other small bits and snippets of wire till he has enough to make a wire toy car to race with his friends. Closing circle time – the Drive-In Movie. All the kids brought their cardboard cars over to circle time, and we watched a movie. I had edited down 12 minute versions of each of these, so we could watch the whole thing. The little kids watched Sid the Science Kid episode #125, “Climb Ignatz”, which is a review of simple machines. The big kids watched Bill Nye the Science Guy’s Simple Machines episode. Note: All the activities described in my posts are from Family Inventor’s Lab, a parent-child cooperative class in Bellevue, WA. We are a play-based, STEM focused class for preschool through early elementary (kids age 3 – 7). We do a wide variety of fun, hands-on activities to learn about Science, Tools, Engineering, Nature, and Art. We also sing songs and read stories. Most of our activities are cheap, easy, and use everyday materials that most families would have in their homes (or their recycle bins! ), so our activities are appropriate for classroom teachers, parents who homeschool, or after school programs.